Mixing Dinner and Business (the most recently completed dk menu) is arguably more common than Mixing Breakfast and Business, but breakfast may also be an occasion for business meetings. With that consideration in mind, this menu is meant to serve a group of ten with a minimum of service activity and interruption–the idea being that guests who have come to talk business want to get down to it. 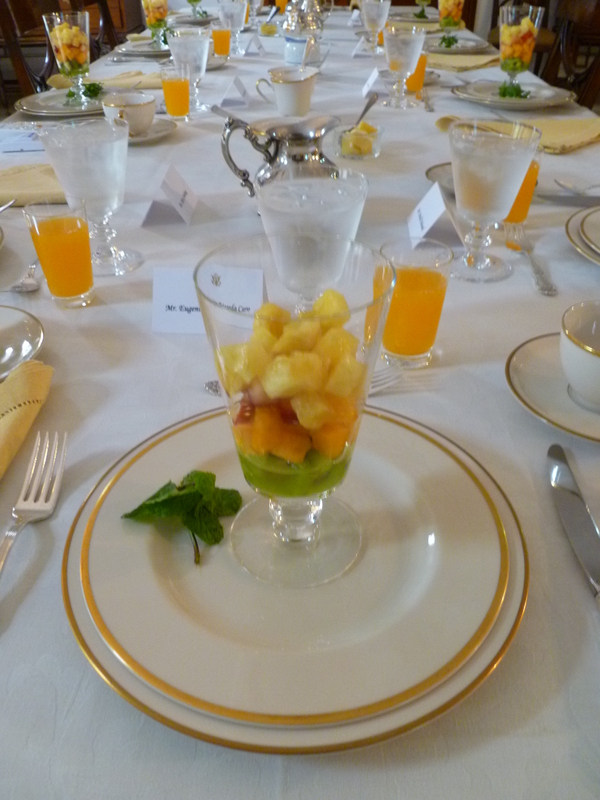 Before everyone sits down, the first course is already set out on the table: fresh clementine juice and verrines of fresh fruit. And, for anyone who wants them, there is vanilla yoghurt and homemade granola to add to the fruit. The second idea underlying this menu is that it is preferable to do business over good food than indifferent food, and the menu strives to offer the former. The third consideration, which is really a firmly-held personal prejudice is….that a couple of large cups of fresh ground, French roast coffee in the early morning hours is the elixir of life and salutary for getting anything done at that time of day. 2. In the mixing bowl, combine the oats, almonds, brown sugar, salt and cinnamon. 3. 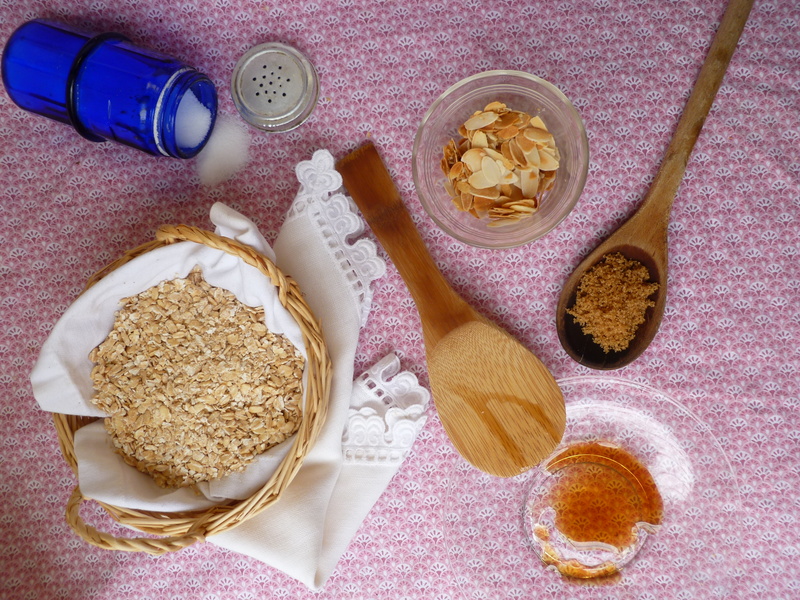 Mix together the sunflower oil and maple syrup in a small bowl and add it to the oat and almond mixture. Blend everything together well. 4. Spread the granola out on the baking sheet. Bake it for 8 minutes….stir it around once…and bake it for about 7 more minutes or until it is crisp and golden. 5. Cool it in a bowl. Offer it, and a bowl of vanilla yogurt, to add to Verrines of Fresh Fruit. Note about verrines: Verrines are savoury or sweet combinations of ingredients layered in clear glasses. 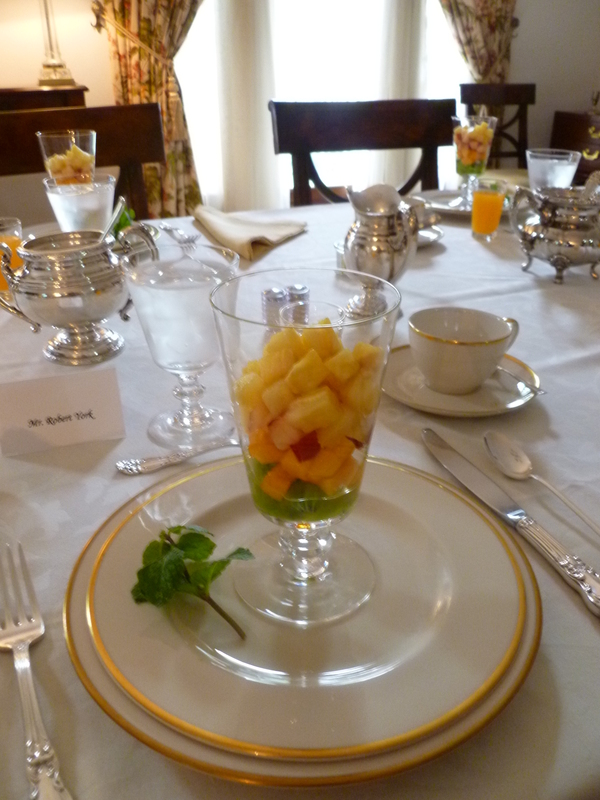 This breakfast menu uses 1-cup size glasses for the fruit. Smaller glasses would also be fine. And…the choice of fruits depends on personal taste, what is available where you live, and what looks good on the day you shop. 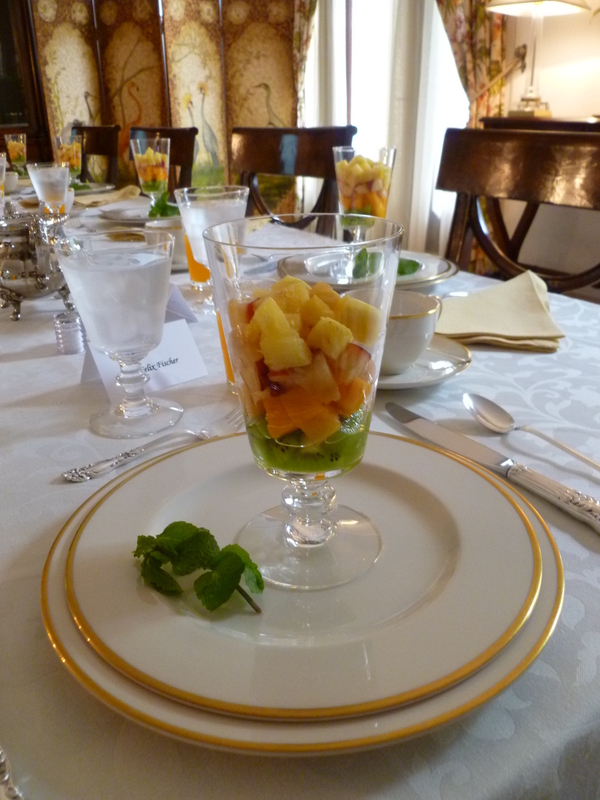 3 or more different fresh Fruits: The photographed verrines include kiwis, papaya, nectarine and pineapple. 1 glass of homemade Lemonade: The recipe appears below. 1 recipe of Homemade Granola: See the recipe above. 10 clear glasses: The ones in the photos hold 1 cup. 1. Cut each kind of fruit in cubes and place each kind in a separate bowl. If any of the fruits are of the sort that discolor once they are cut (nectarines or peaches, for example), stir a Tablespoon or two of lemonade into them. 2. 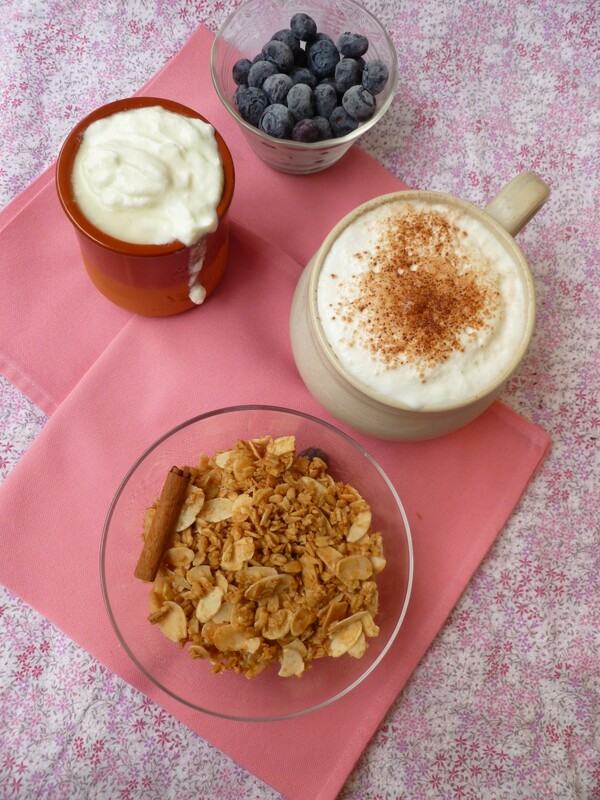 Fill two small serving bowls–one with homemade granola and the other with vanilla yoghurt. 3. Assemble the verrines just before placing them on the table by layering the different fruits in the glasses, leaving some room at the top for yoghurt and granola. 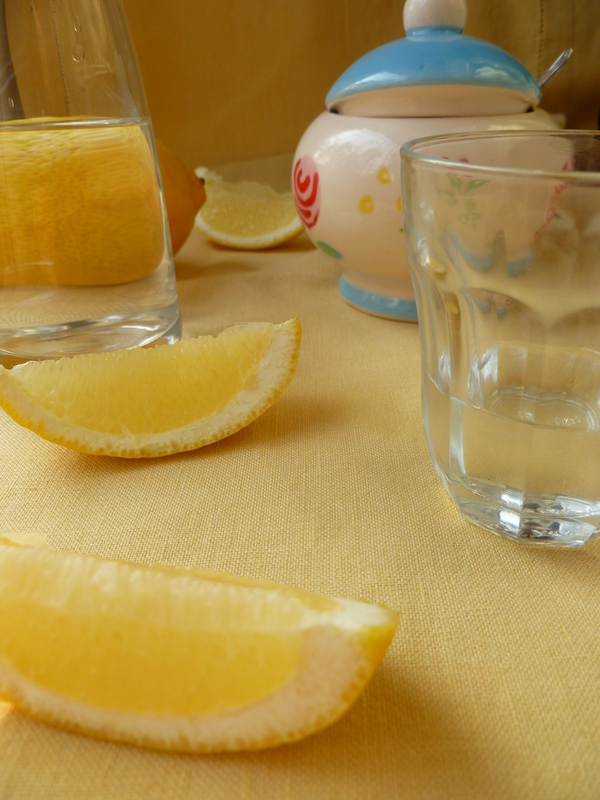 Pour a teaspoon of lemonade into each verrine. Place a sprig of fresh mint on the plate beside each glass if you like. 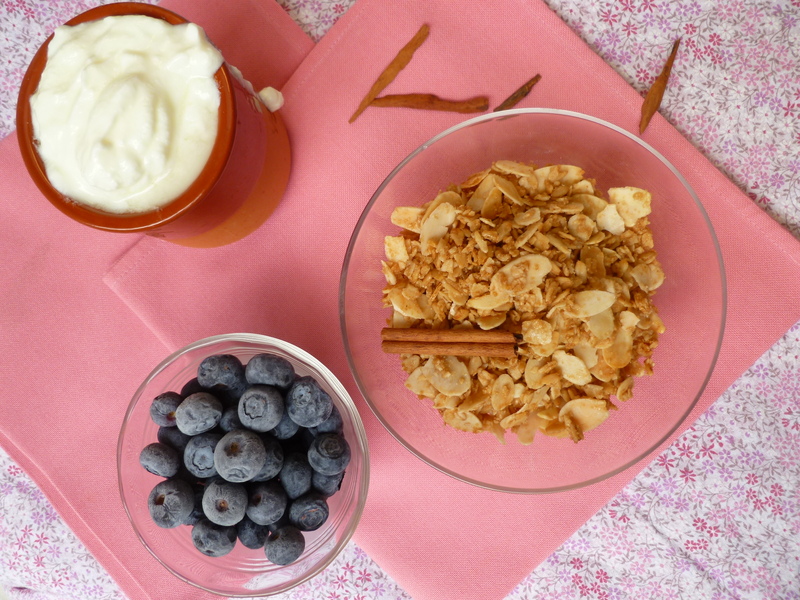 Offer the granola and vanilla yoghurt to add to the verrines. 1. Make Simple Syrup by mixing 1 cup of water and 1 cup of sugar in a pot. Bring the sugar water to a boil over medium heat and continue boiling it for 4 minutes. Cool it. Simple Syrup will keep a long, long while, stored in the refrigerator. There is no exact science to making Fresh Clementine Juice. 10 juice glasses will require about 4 and 1/2 cups of juice. Here is a suggested recipe which is only a starting point for mixing the juice according to your taste. 15 – 20 Clementines: The number depends on their size and quality. 3. Add about 1 cup of cold water to the juice and sweeten it with some simple syrup to suit your taste. There should be something over 4 cups, which will be enough for 10 juice glasses. Note: Verrines of Fresh Fruit with Homemade Granola and Vanilla Yoghurt is the First Course of the Occasional Menu: Mixing Breakfast and Business. The granola recipe is based on one from the food blog Ezra Pound Cake. What an elegant, yet healthy and tasty breakfast ! 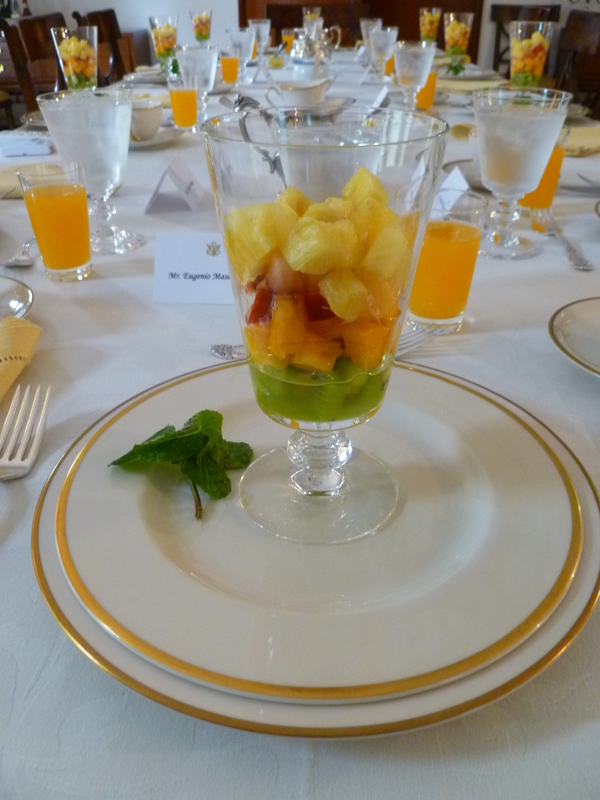 I love the mandarin juice instead of the typical orange, and that everything is fresh and home made. It makes every guest feel special, relaxed, puts him in good humor, and open for discussion ! Very clever ! When they talk about team work in diplomacy, they must have been watching you ! Always looking forward to more ideas from you ! Hi Nena! How nice to get back from a two-week road trip through the Congo and find your nice Comment 🙂 Rebekkah has been website manager while we’ve been on the road and internet-less.